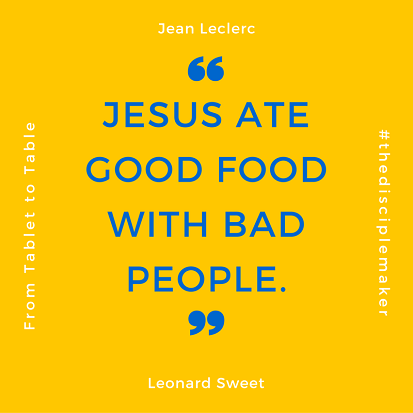 Jean Leclerc offers the best definition of the gospel you’ll ever hear: “Jesus ate good food with bad people.” This was so accurate a description of Jesus that someone in his day composed a satirical jingle about him that went viral: he was “a glutton and a drunkard, a friend of tax-collectors and sinners” (Matthew 11:19). Jesus’ dining experiences became a lifestyle around which he formed a school of disciples, such that John’s account of the Cana wedding suggests that the wine didn’t run out until Jesus and the disciples arrived. As much as Jesus loved food, people always came first. Sometimes he got so preoccupied with people that he forgot to eat (Mark 3:21,31; John 4:31). But the point remains the same. Jesus was killed because of his table talk and his table manners—the stories he told and the people he ate with. Jesus and table so went together that the Pharisees used a table to trap him (Luke 14:1-24). Food is a reference point for Jesus even when he is not eating (see, for example, John 4:32). It was the table that shaped early Christian worship—the Last Supper and the post-resurrection meals Jesus shared with his disciples. The infant Jesus is laid in a manger, from which the animals were fed; there is a table at the stable. At the very beginning of his post-resurrection ministry, Jesus suddenly appears in front of his disciples and asks, “Got anything to eat?” (John 21:5). 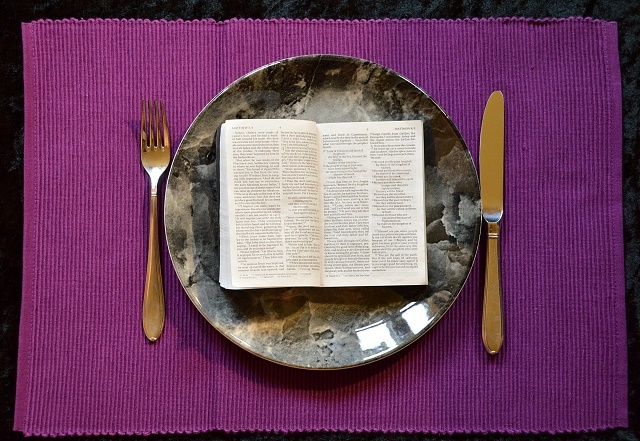 Food is the building block of our Christian faith. We are part of a gourmet gospel that defines itself in terms of food and table. Yet we find ourselves at a juncture in history where we have lost the table and reduced our “food” to non-foods. Instead of setting another plate at the table and passing the food, we pass another program or pass another resolution or pass another law. The Pharisees lived by laws, rules, and exclusions. Jesus showed us how to live by love, grace, and inclusion. At the table we don’t just feed people; we build relationships—stories and memories. We associate people with the stories we hear of them, and the memories we have of them, especially sensory memories: the sounds, tastes, smells, textures, and pictures of them. These are the stuff of metaphors and narraphors. When I want to tell my kids about the grandfather they never met, but am at a loss for words, I get out some Graham crackers, serve them some cheesecake, and tell them about the cherry cheese cake their Grandpa Sweet made from Graham cracker crust, Philadelphia cream cheese, and Del Monte canned cherries. In so doing, I am enculturating them into the Sweet family; I am connecting the dots between their stories, his, and mine. If we really want to learn someone’s story, sitting down at the table, breaking bread together is the best way to start. First dates almost always involve a meal. As many business deals are sealed over dessert as over desktops. As we sit and eat together, we don’t just pass food around; fellow diners pass bits of themselves back and forth as well, exchanging tales as well as condiments. I like any vegetable stir-fried. I like my chicken deep-fried. I like my table story-fied. At the table, where food and stories are passed from one person to another, and one generation to another, is where each of us learns who we are, where we come from, what we can be, to whom we belong, and to what we are called. When I spread apple butter on a biscuit, I am back at my Gramma’s table, eating her daily baked biscuits with Granddad’s apple-butter, straight from his copper apple butter kettle. One of my most cherished possessions and among the most beautiful items in my home, my mother’s Bibles were bound to become battered and dog-eared, their covers blotched with coffee stains and their pages crumpled from tear drops, with all sorts of things falling from their pages. When I read from one of them, I am not necessarily reading the way she read, but because of what that book and its history represents, I am reading the Story with her voice, and with the same thrill and exhilaration as she had when she read it. The best in film criticism sends you excitedly back to the films. The best in biblical criticism should send you excitedly back to the Bible, not to start another critique but to re-enter the story on a wider and deeper level of comprehension. An untabled faith is an unstable faith. A neglect of the table in our churches is echoed in our families and our communities. In his book Cooked Michael Pollan shows that meals eaten out are almost always less healthy than foods cooked in; homemade foods generally have lower fat, salt, and caloric content. And yet we are eating out more and more, eating in less and less. We eat one in every five meals in our car. One in four of us eat at least one fast food meal every single day. US households spend roughly the same amount per week on fast food as on groceries. Sixty years ago, the average dinnertime was ninety minutes; today it is less than twelve minutes. And that’s when we do eat dinner together, which is less and less frequently. The majority of US families report eating a single meal together less than five days a week. And even then our “dinners together” are mostly in front of the TV. No wonder the average parent spends only 38.5 minutes per week in meaningful conversation with their children. We are losing the table. This was brought home recently to the Sweet family when one of my kids invited a friend (let’s call him “Horace”) to spend some days with us over the summer. After the friend left, I commented that Horace seemed somewhat uneasy during his stay in our home. “Was anything wrong?” I asked. “He did feel a little uncomfortable,” my daughter Soren offered. “Was it something we did?” I asked. A Christian teenager, attending a Christian college, had never eaten a home-cooked meal at a family table. The media can be both a thermometer registering and a thermostat regulating the temperament of our culture. And much of our culture today reveals fragmented families with busy, out-of-the-box lives that don’t conform to what is now considered “traditional” mealtimes. 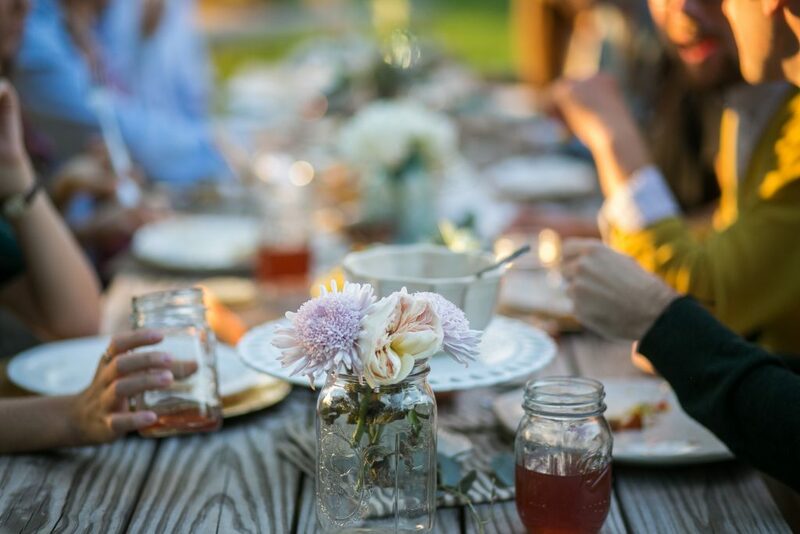 Yet while shows like Modern Family portray families that never eat together at the table, an increasing number of shows, such as Duck Dynasty and Blue Bloods, prominently feature family dinners, including prayers over meals and story sharing. It seems there is a craving for more intimacy in our lives and relationships. And if we can’t get it in our homes, we’ll at least watch it on TV. If you want kids with “fewer emotional and behavioral problems, greater emotional well-being, more trusting and helpful behaviors towards others and higher life satisfaction,” then you need “more frequent family dinners.” In short, better to eat toast and jam together than ham tettrazini alone. Better to eat simply together than haute cuisine alone. In the memories we make and recall, in the stories we tell and retell, in the family recipes we eat and repeat, there are things we learn at the family table we don’t learn anywhere else. There is a reason Jesus made eating a sacrament. But what does it mean to set a “family table”? Jesus defined family differently than the way we’ve viewed it or the way his contemporaries understood it. Jesus must have scandalized more than Nazareth by not being married. As a Jewish man, and especially a rabbi, you had a duty to God, to your ancestors, and to your family to marry and reproduce. Later rabbis put it bluntly: “Seven things are condemned in heaven, and the first of these is a man without a woman.” Far from being a nuclear family advocate, Jesus turned away from his extended biological family, retained his singleness, and claimed instead a discipleship family that included all kinds of people from all walks of life. Jesus ate all kinds of food around all kinds of tables in all kinds of places with all kinds of people. To be a disciple of Jesus (then and now) is to love to eat, no matter what Jesus cooks and no matter where he sets the table. You’re reading From Tablet to Table by Leonard Sweet. Keep reading here! Jesus redefined what it means to “be family,” just as he redefined what it means to “break bread” together at table. When Jesus fed five thousand people on a hillside, all of them became his “family” and the hillside became his “table.” When he cooked along the shore after his resurrection, Jesus’ disciples became his family, and some stones around a fire his table. Jesus ate the Passover meal in the Upper Room not with his biological family but with his new family: his male and female disciples. When Jesus said, “Do this in remembrance of me,” he was really saying, “Do table in remembrance of me.” Whoever “does table” where the Jesus story is re-membered is part of the Jesus family. Eating “in” for Jesus meant more about being in relationship with God and others than inside a specified building. You can eat out and still have a family table. You can eat in and have no table at all. For some, rice and beans or a Big Mac can be a sacred feast if shared together in the spirit of Jesus. For others, the best cooked family meal can be a burdensome offering to grumbling family members. Jesus’ family includes marrieds, singles, widows, orphans, lepers, sinners, even animals. After all, Jesus’ bassinet at birth was a food trough for beasts. If you live alone and your pets join you for food, you are sharing your table with your family. If you share a meal out with friends where stories are shared and love is honored, you have redefined family Jesus-style. 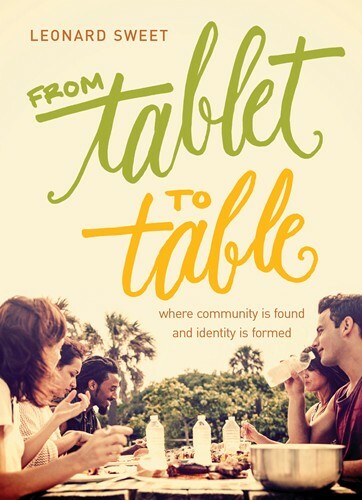 Whether in church, home, or community, the table you set defines your “family” identity, as long as Jesus is present. When Jesus reclines at the table with his disciples in the Upper Room triclinium, he warns “woe” to those who don’t continue his table and those who sit at table and betray (Luke 22:21-23). A betrayal by one who breaks bread at table is far worse than any anonymous backstabber. The more intimate your relationship, the deeper the cut. 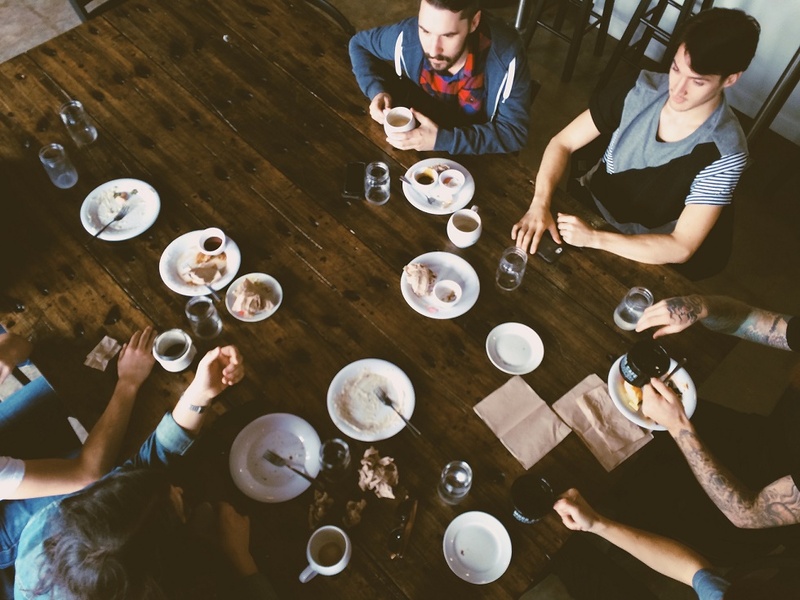 The table is a place of intimacy, and those who feast at Jesus’ table become family together in a new kind of relationship—one that obliterates dissension, walls, bloodlines, and divisions. For Jesus the home is not what defines the table; the table is what defines the home. Whether a single, working mom or an elderly man in a nursing home; whether a four-year-old child or a teenage athlete; whether a married couple or a homeless woman with her dog: we are all invited to Jesus’ table and into Jesus’ family. One of our best descriptions of a “blended” family might be when university students gather. In the university of days past, in the manor building was a great hall, a multipurpose room primarily used for long dining tables and that featured pointed-arch cathedral ceilings which, like the cathedral itself, put humans in their place and scaled them appropriately to the divine. There was a time when students would sit at long tables in these halls to have their meals and to be inducted into the long-standing rituals and rhythms that make someone “an Oxford man” or “an Oxford woman.” Several times a week, there were three-course evening meals which required a formal dress code of gowns and other unique garb. The contrast between these table traditions of the past and the current collegiate “mess halls” couldn’t be sharper. The modern “great rooms” found in today’s student commons are also multipurpose rooms that often feature arched ceilings, but they are architecturally designed to make humans feel larger than life. The rooms have built-in hearths around which people sit, and screens with a bar separate the “great room” from the kitchen or other all-purpose rooms of the commons. But wherever you look, there is no table in sight. And the adjoining cafeterias are chaotic rambling spaces with various drop-by stations catering to diverse ethnic and eating preferences without any common menu or common rituals of community. And then there are online universities, where your entire learning is conducted on a tablet with no face-to-face table time at all. True online learning is peer-to-peer distributed tablet learning and face-to-face immersive table learning, built around a monastic model of community that eats together, worships together, prays together, sings together, lives together, and learns together. The table is necessarily communal. And for Christians, there is a Trinitarian component to the table. Even when only two are gathered together, three are always present. Wherever we break bread together, Jesus is always at the table. And we are to remember him, bring him to life in every heart. Because the life of your table becomes the preeminent art of your life. You “become” a disciple to the Master Artist through your time spent together at Jesus’ table. You’ve been reading From Tablet to Table by Leonard Sweet. Keep reading here! You can also visit Len at preachthestory.com. Very good insights. We have gotten away from the dinner table and from meaningful conversations. My prayer is this younger generation will bring back the days of family dinner, church dinner, community dinner! They kinda forgot the “we tried to kill them” part. The symbol of Christianity is the cross. ‘Jesus Christ came into the world to save sinners’ – and this was achieved by the cross. We are called to repentance in response to God’s love – to seek to live as He commands. ‘Small is the gate and narrow is the road that leads to salvation’. That’s hard to hear – but if our message loses it, then we’re not presenting all of Jesus.